This post leads on from a previous one which looked into using some software called Po-motion to create an interactive wall display. Since installing this system, I have been in contact with a fantastic teacher, Anthony Rhys (@trinityfieldsit) who has been doing some fantastic work with his students using the Kinect system and Ipads. He has also set up a great wiki at on apps to use with SEN http://ipad-sen-plcsouthwales.wikispaces.com/ He was the one who originally pointed me in the direction of the Visikord software and as soon as I got our hands on a Kinect I knew I had to try it out. Visikord is a piece of software originally designed for nightclubs and parties. It turns your TV, smartboard, projection etc. into a mirror-like ‘smart screen’ which gives off stunning visual effects as someone moves to music. It allows the user to interact with the music both through sound but more importantly vision. The software works on a PC (Windows XP or higher) and you need a Microsoft Kinect or Asus Xtion. The software is free to download as a demo version and this is the version I have been using in class. The setup I used is an XP laptop with an Xbox Kinect connected. Installed on this are the Primesense and OpenNi drivers which come with the download of Visikord. I trialled this with some of my sixth form students and they instantly liked trying to produce different effects in time with the music. Also those students who tend to shy away from physical exercise, wanted to have a go and were very active and wanting to interact with the music. Later on, one of our PMLD students had a go with the software. What was great to see was the instant reaction to the sound and the visuals coming from the screen. Though the student only had limited movement the Visikord software still pick this up and produce visuals to match the music. They were attracted to the bright visuals and in turn were responding to these and the music. I really like the potential for using Visikord and the Kinect especially in relation to our sensory room at school. Over the next few weeks I will add a Kinect in the Classroom section to the blog which will look into the different options for setting up the Kinect (windows or xbox version) and recommend some of the open source software that is being developed that would be useful for SEN students. A really insightful day looking at how professionals and schools working with SEN have implemented the iPad as a tool to support teaching and learning, in addition to breaking down some of barriers to learning that are in place for many of these learners. The theme from all of the delegates was that the iPad was not the answer to all problems, however it was a tool with so many uses and enables students with SEN to lead the learning. This post is part one of the two where I will give an overview of some of the presentations that occurred in the morning. The second part will look at the other presentations and the discussions that took place in the afternoon. John Roberts @johnmroberts – Presentation about how the iPad has helped develop his sons fine motor skills and his communication. John gave an excellent presentation from the view of a parent and how the iPad has helped his son to develop his fine motor and communication skills. Through the use of apps like Peppa Pig and Talk 4 Me, his son is able to work on these skills and has helped him engage with others. Of particular note was that his son will now ask for the iPad when he wants to use it, whereas he would not communicate his needs verbally previously. Also he talked about how YouTube was a great motivator for his son to complete his work. More interesting though, was through the use of YouTube, they were discovering that he was able to follow threads to find things that interest him just by accessing videos and following similar links. A really inspiring presentation to begin the day and it was great to see how the iPad had opened up the world of learning for his son. Tap Speak Choice – allows scanning with a Bluetooth switch, PCS Symbols and you can add your own communication book. Tap Speak Sequence – can store multiple conversations, Bluetooth switch and Airplay compatible. Tap Speak Button – works like a big mac on the iPad!!! Predictable – predictive text for those who use AAC devices. Allows switch access and the ability to update Facebook and Twitter accounts. Gridplayer – Communication boards which use Widget symbols, comes with three complete grid sets. Sentences are spoken in English. Grids can be customised with PC software The Grid 2. Proloquo2go – Another AAC app. Use of iPod touches to help communication in group settings. Showed an example of this, with a video where students were able to respond to group discussions with the use of iPods connected to external speakers. Excellent example of how the use of technology is helping students communicate and collaborate. Using the schools VLE/website to communicate with staff and parents about the apps they use in school, so that parents can continue learning at home. VLE also included booking section for staff to book out the class set of iPads. Well thought out use of VLE to share experiences of students using the iPad. Excellent presentation about the need to assess students on the suitability of the iPad as a communication tool. Key point was to ensure that clear aims were in place for using the iPad as a communication tool instead of other AAC devices. Communication app that was used was the Grace app which is a non-speaking, picture exchange app to help students communicate their needs independently. Milk the Cow – very sensory and does what it says. Peekaboo Barn – students have to guess the animal from the sound and open the barn doors to see if they are right. I was first shown this app at a training day and really liked the simplistic interface for recording your own shows. 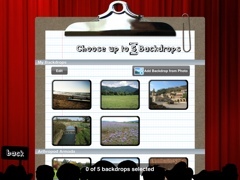 I was looking forward to using this app with my students to allow them to create their own movies. I chose the theme of Aesop’s Fables and the lesson was planned so that everything that they needed to do they would do on the iPad. The reason I chose a theme rather than letting the students come up with their own creations was that some of my ASC students struggle with creativity and I wanted a level playing field for all students to participate in the activity. They first had to choose an Aesop Fables that they were going to recreate. These were available on iTunes U for free which allowed them to listen the story and note down the key points. Next they created a mind map using the app ‘Popplet’ and noted down what characters, settings and scenes they needed for their movie. Once this had been done the students got searching on the internet for the various images they would need. Now onto Puppetpals. When you first start a new show you need to select the actors. Puppetpals comes preloaded with various actors and backgrounds but would recommend purchasing the ‘Directors Pass’ which allows you to download more themes. The students found importing the images really easy as they had saved them to the camera roll. 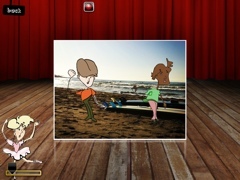 Puppetpals allows you to import pictures from the camera library or take a photo using the iPad’s camera. If you want more high res images, some students used the digital camera then transferred them using the camera connection kit (more on that in a later post). Once they had selected the images, Puppetpals allows you to draw round a particular part of the picture to cut out the background allowing you to create your actors. So once all the actors had been imported and selected the next step was for them to choose their backgrounds. Again the students imported pictures from the camera role and resized the images to make their backgrounds. Once the backgrounds had been selected it was onto filming. With Puppetpals, when you press the record button everything you do on screen is recorded as well as any sounds made. The students soon learned that they had to be quiet during the recording process as any background noise would be included. What really struck me about Puppetpals, was how quickly students with Severe to Moderate Learning Difficulties pick up the controls as if it was second nature. Some students struggled with the pinch-to-zoom motion, to increase/decrease the size of the characters, due to their physical limitations, but overall they were able to quickly film their scenes using the friendly and intuitive interface. What was also nice to see was the students discussing amongst themselves the different roles they would undertake and making decisions collaboratively as a group. Once each scene was made they saved them and then exported them into iMovie to make the final edits. The students enjoyed making these videos and were excited to share them with each other. To conclude, I found using Puppetpals in the lesson as an excellent and simple tool to help students create their own movies. The interface is very simple to use and all students were able to participate in the activity. Below are their finished movies, enjoy! !